Constable Glidden was shot and killed by an auto thief. The suspect had stolen a car in San Francisco and driven it to Lancaster. The suspect had painted the car a different color and attached stolen plates. Constable Glidden and other Deputies from the LA County Sheriff’s Department stopped the suspect and started to question him. The suspect panicked and got into the stolen car and started to drive away. Constable Glidden jumped on the running board as the car drove away and drew his service revolver. A curtain in the car prevented Constable Glidden from seeing the suspect draw a weapon. The suspect fired his weapon striking Constable Glidden causing him to fall from the moving car. 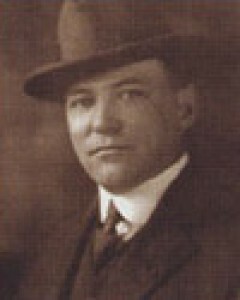 Constable Glidden died at the scene from his injuries. The Los Angeles County Sheriff’s Department started a large manhunt for the suspect that included teams of Deputies on horseback and airplanes. The suspect was shot and killed in a gun battle with a Los Angeles County Special Deputy Sheriff.